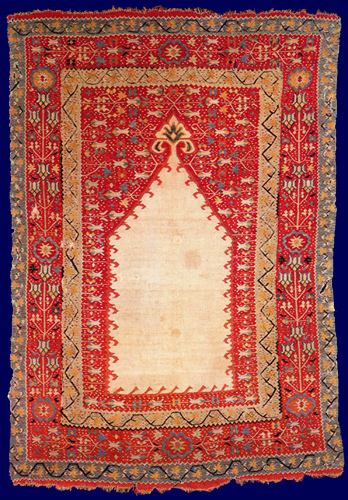 The structure of this prayer kilim or niche-hanging suggests a west Anatolian origin. The quality and intricate nature of the weaving and its similarity to a small group of kilims with horizontal stripes and comparable floral decoration point to a specific professional workshop serving a sophisticated clientele. Whether or not the decidedly Ottoman nature of the floral motifs, particularly the tulips, indicates a court connection is another question. It could just be that the weavers worked from a design language that was by then common currency. The only other niche rug in this group is a fragmented example in Ankara. A wider family of more rural Anatolian kilims grew out of this nucleus, but they lack the finesse of the parent group.